A Russian Soyuz rocket blasts two cosmonauts and one NASA astronaut toward the International Space Station from Baikonur Cosmodrome in Kazakhstan on Sept. 25, 2013. A Russian Soyuz rocket launched a new U.S.-Russian crew on an "express" flight to the International Space Station Wednesday (Sept. 25), kicking off a six-hour sprint to the orbiting laboratory. 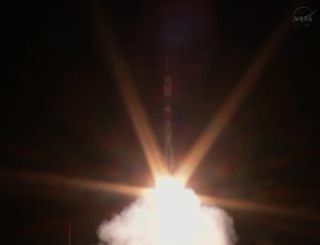 The rocket launched a Russian-built Soyuz space capsule carrying NASA astronaut Mike Hopkins and cosmonauts Oleg Kotov and Sergey Ryazanskiy blasted off at 4:58 p.m. EDT (2058 GMT) from the Central Asian spaceport of Baikonur Cosmodrome in Kazakhstan, where the local time was 2:58 a.m. Thursday, Sept. 26. The trio of spaceflyers is expected to arrive at the space station at 10:48 p.m. EDT (0248 Sept. 26 GMT), hovering through the hatch, joining the three astronauts currently aboard the station about 90 minutes later. You can watch coverage of the docking here on SPACE.com via NASA TV beginning at 10 p.m. EDT (0200 Sept. 26 GMT). Astronaut Mike Hopkins sits in his seat aboard a Soyuz spacecraft before launching to the International Space Station. Image released Sept. 25, 2013. This trip marks the first spaceflight for Hopkins, a colonel in the United States Air Force. Chosen as an astronaut in 2009, the NASA fitness guru will be the first in his class to travel into space. It took about two and a half years of training to prepare for this trip to the space station. "I'm certainly very honored and feel very lucky to be the first from my class to launch into space, but I think it's very exciting for my classmates as well because this is the start of our time," Hopkins told SPACE.com about two weeks before launch. "I look forward to watching the rest of my classmates in the future launch to space as well." Kotov has already flown two six-month stays on the International Space Station including a stint as the commander of Expedition 23 in 2010. Expedition 37 NASA Flight Engineer Michael Hopkins, far left, Soyuz Commander Oleg Kotov and Russian Flight Engineer Sergey Ryazanskiy, far right, wave and give two thumbs up following a press conference held at the Cosmonaut Hotel, on Tuesday, Sept. 24, 2013, in Baikonur, Kazakhstan. Once fellow Expedition 37 crewmembers NASA astronaut Karen Nyberg, European Space Agency astronaut Luca Parmitano and cosmonaut Fyodor Yurchikhin fly back to Earth on Nov. 11, Kotov will take over as commander of Expedition 38. This is also the first spaceflight for Ryazanskiy. "Probably everyone who goes to space is looking forward to seeing our planet," Ryazanskiy said during a NASA pre-flight interview. "It is an amazing view. That is what I have heard. There will be some unforgettable impressions. That is what I am looking forward to. Everything else besides that is everyday routine, even though sometimes it can be very interesting. This is what we were training for." SPACE.com partner Spaceflight now is also offering updates about the Soyuz launch and space station arrival via its Mission Status Center.